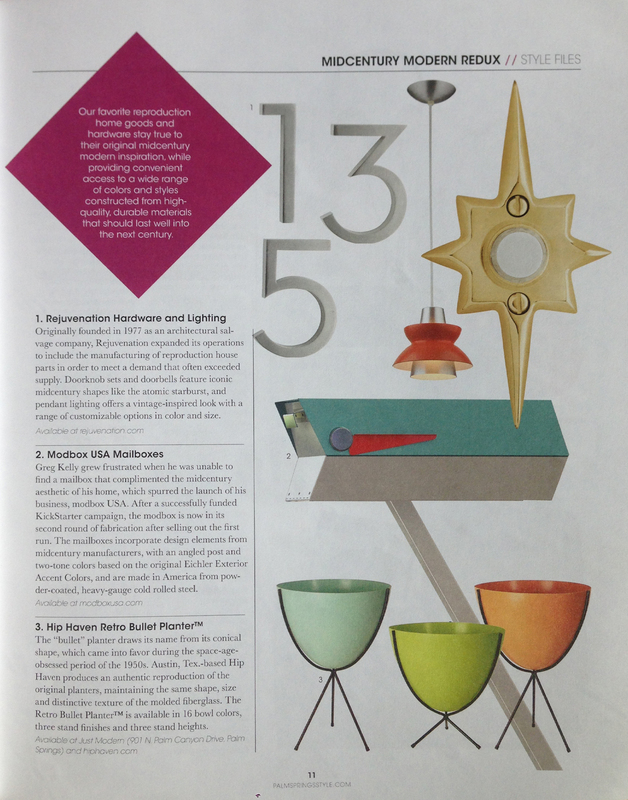 The modbox was featured in Style Files on a page/collection called Midcentury Modern Redux. Check it out! Modbox was honored to be featured with the likes of Rejuvenation, Hip Haven, and Just Modern! Rejuvenation (acquired by Willams-Sonoma in 2011) expanded operations to manufacture and sale reproduction house parts to meet demand that often exceeded supply (sounds like the modbox story!). Their mid-century modern collection includes just over 100 items. With doorknob and doorbell sets featuring iconic midcentury shapes like the atomic starburst. Hip Haven’s success with a Retro Bullet Planter (16 color options) provided proof that the retro modbox might have a chance. Owner and designer Kelly Sandidge opened online in May of 2002. Thanks for the inspiration Hip Haven! The trifecta of curb appeal for a mid-century modern home is Hip Haven’s retro bullet planter and spun aluminum dual sconce, paired with modbox’s retro mailbox! Just Modern specializes in unique, mid-century modern inspired home accessories, art, furniture and decor. Founded in 2011 by J. Chris Mobley and Stewart Penn in Palm Springs, CA. I’m loving their Atomic Starburst Pillow! Check out the Urban Gasfire by ModFire too (five mid-mod colors)!